The hopes of north-east campaigners were raised yesterday after the transport secretary confirmed improvements to a notorious road would be included in a review. Activists have long called for the A90 Aberdeen to Peterhead stretch beyond Ellon to be converted into a dual carriageway. 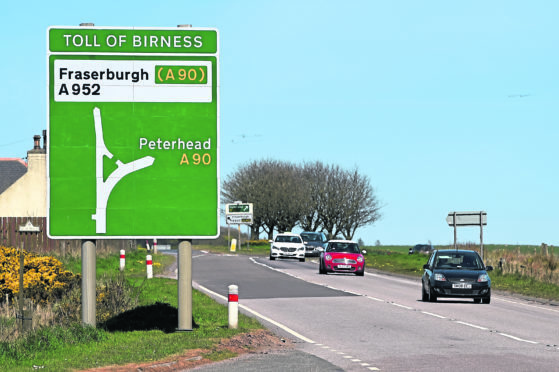 They also want the recently-opened AWPR connected to this stretch of the route, on which vehicles regularly crash at the Toll of Birness junction to Fraserburgh. Figures out last year showed how hazardous the route is with 63 crashes in 2017-18, compared to 50 the year before. North East Conservative MSP Liam Kerr raised the issue at the Scottish Parliament and quizzed Transport Secretary Michael Matheson. Mr Kerr demanded that the dualling of the A90 be “right at the heart” of a major Transport Scotland review. He said: “The opening of the AWPR does seem to have increased travelling north to Peterhead. Mr Matheson responded that the possibility of upgrading the A90 Ellon to Peterhead road would be considered as part of a second Strategic Transport Projects Review (STPR2) by Transport Scotland. Peterhead councillor Alan Fakley is backing the Dual Peterhead group, which wants to boost the town’s economic fortunes by improving the roads. They are campaigning for better connections between the town and the AWPR via a new dual carriageway. Mr Fakley said: “I’m delighted to hear we are on the radar now for a possible dual carriageway to Peterhead. Dylan Clarke from Dual Peterhead said Mr Matheson’s intervention debate was a positive step.